Description - This robin-sized nocturnal owl is short tailed and long-legged. The adult is boldly spotted and barred; the face is framed with white and has a blackish collar. The eyes are yellow and they have no ear tufts. The voice is a liquid cackling or a mellow "coo-coooo" which is repeated twice. 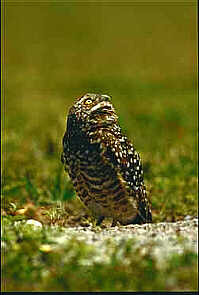 Distribution - The burrowing owl breeds from Canada's prairie provinces south throughout western America. They winter in the southwestern states. They inhabit deserts, plains, fields and airports. Biology - This owl feeds on rodents, birds, reptiles, fish and large insects. Although capable of digging its own burrow, it usually will claim one abandoned by a prairie dog or pocket gopher. After lining it with grasses, roots and dung it will lay 5-7 white eggs there.